There seemed to be an emphasis in Women’s Equality and Empowerment. “We cannot grow the global economy if we do not open the doors to women to participate in the economy,” says Hillary Clinton. There were a number of sessions dedicated to women’s causes, including, “Equality for Girls & Women: 20334 instead of 2134″ with Melinda Gates of the Bill and Melinda Gates Foundation and “Girls and Women Strategy Session” which welcomed an audience discussion including, Dr. Dorothy Okello, Founder of Women’s Network of Uganda; Michael Nutter, Major of Philadelphia; and Jane Wurwand, founder of Dermalogica. The diversity gap of women in tech was also mentioned and new commitments were made to address the issues. In 2014, Sodexo committed $1 Billion to creating a more inclusive global supply chain for its hospitality products, forming partnerships between its local operations and small to medium sized businesses run by women in the developing world. By working with female farmers and manufacturers, Sodexo will not only improve the lives of those women, but to boost local economies by linking up small businesses to the rest of the world. “Small Business, Big Impact,” will also offer training to help owners take their companies to the next competitive level. In 2011, the Grassroots Business Fund and its partners committed to support 60 high impact businesses across Africa, Asia and Latin America, providing job and economic opportunities to 20 million people over the next 10 years. Utilizing its private social investment fund Grassroots Business Investors, GBF engages in deals averaging from $500,000 to $1.5 million. As of 2014, GBF has provided $20 million in support, one-third of the way to its $60 million goal. The National Service Alliance was formed because large-scale national service can help reconcile traditional social structures that have begun to come apart. For instance, nearly one million students drop out of school each year and 17 percent of youth aged 16-24 are out of school and work By giving young Americans a stake in the outcome of their communities, they are empowered to solve social ills and renew the country’s civic identity. In 2014, the National Service Alliance joined forces with the Cisco Fund at the Silicon Valley Community Foundation and the Lumina Foundation to launch Service Year, a four-year campaign to encourage 18-28 year olds to engage in a year of service as a strategy to tackle the nation’s most pressing challenges, while empowering and developing the next generation of civic leaders. By 2017, this initiative aims to create 30,000 new Service Year opportunities, with the goal of creating one million service opportunities annually by 2023. Over the next 3 years, Bluedrop will provide a free, country-wide training platform for up to 30,000 vulnerable people in Jordan. The organization will provide its learning platform to help build the local training capacity required to better equip marginalized groups in Jordan for new jobs, entrepreneurship and small business success. Bluedrop’s Entrepreneurship and Workforce Resilience Program is directed at supporting affected and vulnerable populations to the effects of the crisis in the short-term, while at the same time, building national and local capacity to scale up and sustain recovery. 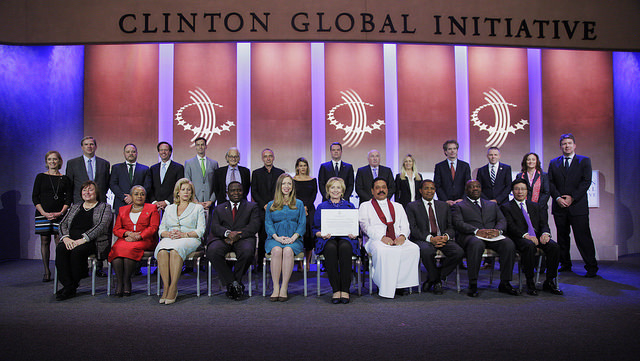 To date, the Clinton Global Initiative (CGI) has brought together more than 180 heads of state, 20 Nobel Prize laureates, and hundreds of leading CEOs, heads of foundations and NGOs, major philanthropists and have made more than 2,900 commitments, which are already improving the lives of more then 430 million people in over 180 countries. Click here to watch some videos from the event.